An investigation has been launched into an incident where a council worker was splashed with molten thermoplastic whilst painting lines on a road in Oxfordshire. The unnamed person was employed on a sub-contractual basis by engineering company Skanska when the incident took place on Sunday 13 March 2016. 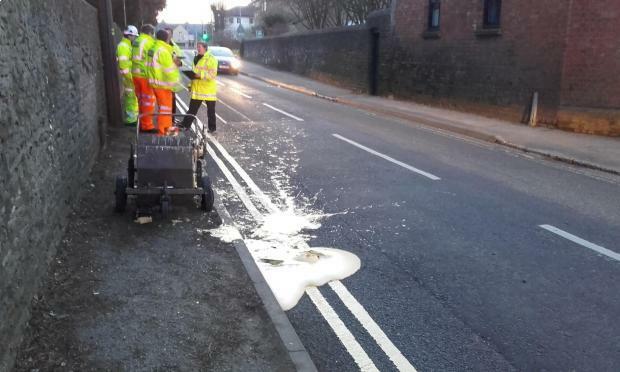 It is understood that a passing car accidentally hit the barrow used to paint lines, spilling a quantity of molten thermoplastic onto the worker, who was subsequently rushed to hospital. If your business puts workers in hazardous working environments, it is your responsibility to ensure their safety. As well as good health and safety policies, your business should also consider employers’ liability insurance in addition to the required general business insurance. Paul Smith, a spokesman for Oxfordshire County Council Highways, said of the incident: "The injured person was taken to hospital where they received treatment. An Oxfordshire County Council worker told the Oxford Mail that the paint left at the scene will be chipped away.